When the Supreme Court in Hobart convenes for the final, crucial session on August 20, 2018, to hear Sue Neill-Fraser seeking leave to appeal against her murder conviction, members of the official Sue Neill-Fraser Support Group Inc. will be there for her, as they have been since even before her controversial murder conviction in October 2010. Who are they? What drives them? How did they coalesce into the determined and persistent citizen army they have remained? What have they achieved? For those unfamiliar with the Neill-Fraser case, our March 2015 report provides a full background briefing. It is one of several media reports over the years (of them a great many published here on Wrongful Convictions Report), but the extensive, highly visible role of the Sue Neill-Fraser Support Group has never been properly reflected in those reports. In this double-decker feature, we offer readers (and the record) an insight into this multi-faceted group of women and men from around Tasmania who are united in their firm belief that Neill-Fraser’s conviction is an egregious miscarriage of justice. Their most notable achievement – other than providing emotional and psychological support to Sue Neill-Fraser – has been keeping the case in the public spotlight with the basic proposition that the conviction failed the test of ‘beyond reasonable doubt’. Unmerciful in their criticism of Tasmania’s criminal legal system, keen-eyed members of the Support Group have carefully deconstructed the case against her and found it wanting. Herrera then demonstrated why the timeline of events as put by the prosecution is an impossibility. Herrera and others in the Support Group have often shown such acute detective skills. 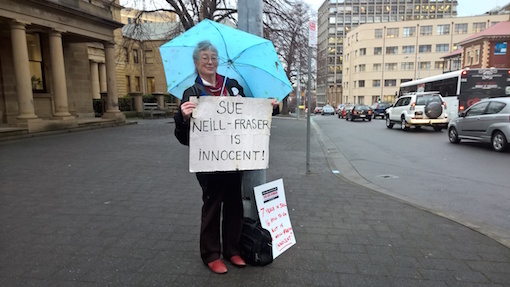 When Sue Neill-Fraser first came up in the Hobart Magistrates Court several people came along to support Sue and her mother Helen, including Lynn Giddings, Rhoda Gill, and myself, Jennie Herrera. What we heard was an entirely circumstantial case, devoid of evidence. So we were very surprised to learn that it was to be sent to trial. Friends and supporters also came to the Criminal Court in 2010 to join Sue’s family including her first husband Brett Meeker—and we all sat and listened to an equally circumstantial case. It was hard to accept some of the things we saw in that court room. The DPP showed a large knife to the jury and left it sitting in their full view for the rest of the trial but then he suggested a wrench, then a screw-driver, then a ‘something’ as a murder weapon. We, in our innocence, had always believed that assertions in a criminal trial have to be backed up by evidence. 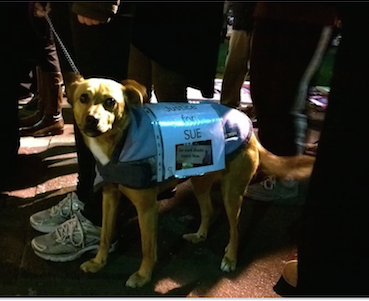 When Sue was given a 26 year sentence it was hard to believe. Neither the Appeal nor the attempt to get the High Court to look at the case were successful—which members of the public often took as evidence of guilt without understanding that appeals look at mistakes in law, not the many problems there are with the adversarial trial process or with police investigations where police have focussed on ‘the most likely person’ rather than a thorough investigation of every aspect of a death. But the difficulty for family, friends, and wider community concern was how to create support without making life in prison harder for Sue. Amanda Stark arranged a vigil at Marieville Esplanade on the anniversary of Bob Chappell’s disappearance. Rebecca Harrison organised a get-together in the Botanical Gardens to bring sympathetic people together. There was some confusion over just what a support group could or should do. Were we mainly there to visit and support Sue and her family? Should we be lobbying the government? Should we be raising money or just awareness? Should we be trying to find other information, in effect doing some sleuthing ourselves? Only a few supporters had any legal knowledge and although many of us had been involved in activism or charity or community work we had never tried to overturn a conviction or get someone in Tasmania out of jail. As more people came forward to express their doubts about Sue’s trial and conviction we could see that all these reasons for creating a support group were relevant. We began to hold regular meetings and to hold regular vigils. This made it easier for members of the public to come forward with offers of help. Barbara Etter came forward to offer Sue pro bono legal help. Minneke Haynes donated the printing of thousands of leaflets which more than a dozen supporters letterboxed around the Greater Hobart area. Filmmaker Eve Ash produced her film ‘Shadow of Doubt’ which when shown in Hobart, and later sold on DVD, brought more people forward. A band in Melbourne called Grand Jury composed and produced a CD, and the idea of a play eventually resulted in a season in Hobart for the play called ‘An Inconvenient Woman’. Three people put up $40,000 for a reward. Rosemary Phelps created a Facebook page and an email network for people who couldn’t come to meetings. Lynn Giddings kept people in touch through regular news bulletins. Although the government, police, and media showed little sympathy it became clear to us, through what people were offering and what they needed from us, that we needed a much more structured approach to supporting Sue and needed to be able to reassure people that donations would be fully accounted for and well-spent. Rhoda Gill prepared a constitution and carried the process through Corporate Affairs for the support group to formally become an incorporated body, the Neill-Fraser Support Group, Inc. Over the years the group has had a number of presidents, secretaries, and treasurers, and has organised fund-raisers, particularly to pay for the hiring of billboards around Hobart, as well as rallies, vigils, film nights, and social events. We also purchased, or had donated, badges, t-shirts, and stickers. the jury never learned that Richard King, who made the worrying phone call to Sue on the night Bob Chappell disappeared, and Philip Triffett who went to the police two days later to say Sue had tried to hire him as a ‘hit man’ knew each other and both lived on a country road north of Hobart, called Back Tea Tree Road. that several people who had gone to the police or the DPP with information had been dismissed as irrelevant. that a time-line of all that the Crown said Sue had done that night put in to the Crown’s own time frame showed it simply wasn’t possible. that the yacht’s EPIRB supposedly found by a man from Berriedale, Robert Macleary Page, on the 27th January 2009 and handed to Glenorchy Police had, according to Page, been found above the high water mark on Maning Avenue Beach. that in less than 4 months 3 middle-aged yachtsmen had gone into about a square mile of the Derwent and died; Peter Irwin found dead in the water at the Sandy Bay Yacht Club, a man found dead in the water at Constitution Dock, and Bob Chappell supposedly killed in the area between these two apparent drownings. although appeals can look at mistakes made by judges and lawyers there is no mechanism to look at the many problems which can lead to wrongful convictions. These include: poor forensic investigation, non-disclosure, mis-identification (eg. the ‘female outline’ supposedly seen by a John Hughes may well have been local yachtsman, Grant Maddocks, who had long hair in 2009), lying by police, lawyers, or witnesses, honest mistakes or confusions by witnesses as to times and places (eg. there was both a yacht and a catamaran called ‘Four Winds’ on the Derwent that day and both looked quite similar from side on—yet no witness was asked if they were sure they had seen the yacht rather than the catamaran), racism, sexism, the floating of rumours (including the still widespread rumour that Sue killed her first husband Brett Meeker) etc. We arranged for Bob Moles, the Adelaide based legal academic and expert in miscarriages of justice, to visit Hobart and began lobbying the State Attorney-General, Dr Vanessa Goodwin, to bring in legislation that would allow for further appeals. We got nearly 2,000 signatures on a petition and about twenty supporters went to Parliament House to listen to the debates on the proposed bill. Eventually it was passed unanimously through both Houses of Parliament in 2015. Although we would have liked it to be stronger, it only allows for the very subjective ‘new’ and ‘compelling’ definition, it nevertheless meant that Sue could now apply for a new hearing once it was signed into law. Barbara Etter was accused of ‘Contempt of Court’, her new solicitor Jeff Thompson was accused of ‘Perverting the Course of Justice’, two potential witnesses were also accused of ‘Perverting the Course of Justice’ which has meant that Sue’s supporters have spent the last six months in and out of court in support of both Sue and those who have got caught up in the case. W.A. Barrister Tom Percy QC took on the case pro bono with the help of Melbourne lawyer Paul Galbally, a key reminder that high profile lawyers also have doubts about the safety of Sue’s conviction. 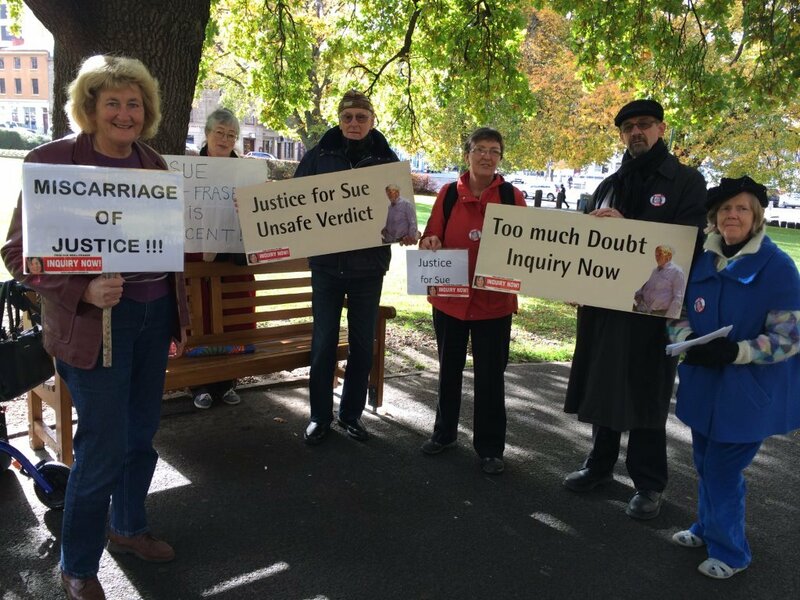 Over the years supporters have come from two directions, those who believe absolutely in Sue’s innocence and those who believe that there are sufficient problems with the police investigation and the court process for her conviction to be regarded as unsafe. In practice these two views tend to coalesce into dedicated support for Sue. Unlike other kinds of campaigns the support group has brought together people from varying backgrounds. (Even man’s best friend … woman’s best friend – see photo.) Sue herself was a member of the Young Liberals years ago, the parents of a former Labor premier give endless time and support, several passionate Greens members are committee members. Sue is an Anglican, her supporters include Catholics, Uniting Church people, Mormons, Quakers, and atheists. Although at times we have been unsure where best to put the group’s time, effort and money, these problems have always been worked out amicably. Although we occasionally get abused the vast majority of people are sympathetic and interested. We hear a variety of possible scenarios from people who believe Bob Chappell is living the high life everywhere from the South of France to Bermuda to North Queensland, to the people who believe Bob’s body was fed to pigs on a Derwent Valley farm to the man who thought he might have been stuffed in a fridge and dumped in the river. We hear from overseas visitors shocked to learn that a miscarriage of justice could occur in peaceful Tasmania. Sometimes girls who have been in prison with Sue rush up to us at vigils to give us a hug and say things like ‘Sue turned my life around!’. At the time of Sue’s conviction the media implied she was a wealthy woman who got what she deserved. That has gradually changed. It is good to see media people, such as Charles Woolley, strongly in support of a new trial. And even people who were initially antagonistic, like Andrew Rule in Melbourne, have now taken a more sympathetic stance. But the fact remains that our justice system has deep flaws and our greater awareness of these flaws is of little comfort. We continue to hope that we can both get Sue out of jail and shine a light on aspects of Tasmanian justice which are careless, biased, incompetent, and even corrupt. On Friday night, 15 October 2010, when a Supreme Court jury found Susan Neill-Fraser ‘guilty’ of murdering Robert “Bob” Chappell, her partner of 18 years, her daughter, Sarah Bowles, told the press, “This is certainly not the last you’ll see of us here, we’re just going to keep fighting until we get Mum acquitted”. Sarah not only spoke for herself, her sister and her friends and family, she spoke for many of us who sat through the trial that had commenced on Tuesday, 21 September. “I am disappointed in the way justice has been dispensed and I believe this case should concern every Australian person. Many of us were numb with disbelief. There was no body, no weapon, no motive, no eye witness, no confession and a trial that felt like one of speculation, innuendo and mockery. But our attention was immediately drawn to the press reports the next day, 16 October, of the biggest cocaine haul in Queensland’s history, about 800 km off the coast. A luxury catamaran, Edelweiss from South America had a rendez-vous with Mayhem of Eden, a sloop that had moored at Scarborough Marina, the same marina where Sue and Bob had purchased their yacht, Four Winds. Pity the jury hadn’t heard of this before considering their verdict; all they had heard was that Sue’s ‘drug theory’ was rejected, quashing “speculation that drug smugglers could be responsible for the disappearance of a Hobart yachtsman” (Mercury, 24 March 2009). What wonderful support you have all given me; literally through ‘thick and thin’. Don’t really know how to thank you, except to say I am so very grateful. Most of us doubted that there could actually be a conviction, due to the small matter of a total lack of evidence. Now, with the new and notorious ‘label’ of ‘convicted killer’, I envisage a long struggle for justice, similar in some ways to the ordeal that Lindy Chamberlain was subjected to. Without the love and support of Emma and Sarah, my wonderful daughters, their husbands, my mother and brother, extended family and a determined group of friends and supporters, I would not have had the strength to continue. As it is I will fight on with renewed determination, through all legal channels available to me. I am so disappointed in the way justice has been dispensed in this matter and I believe it should concern every thinking person in Australia. If this can happen to me, it can happen to anyone, and although I understand that I must physically accept the court’s judgement, I shall continue to protest my innocence most vehemently. I loved Bob deeply and would never have harmed him. I now place my faith in the appeal process and can only pray that in the fullness of time I will be vindicated. I received a copy of Sue’s two-page letter of which this represents a part. I do not know who else received it or how many copies were posted but Sue, herself, had picked us out as “a determined group of friends and supporters”. This was our ‘naming’ moment. Supporters of the 57-year-old grandmother have launched a website petition in support of a re-trial. A petition on the site has attracted nearly 100 signatures since it was started on November 1. The petition has gathered signatures from all around the world, including the United States, Italy, the United Kingdom and New Zealand. Supporters of convicted murderer Susan Neill-Fraser have organised a fundraiser to raise a reward for details on the high profile case. Neill-Fraser was convicted of killing her partner of 18 years, Bob Chappell, on their yacht Four Winds on Australia Day 2009. The body of Mr Chappell, the then Royal Hobart Hospital chief radiation physicist, has not been found. Event organiser Rebecca Harrison said the group would hold a fundraiser at the Royal Tasmania Botanical Gardens from 1pm on Sunday. Ms Harrison said: “Susan Neill-Fraser is serving her second year of a 26-year sentence for his murder. Supporters have started an online petition for a retrial. Neill-Fraser appealed her conviction and sentence in August. The outcome is expected early next year. …More than 30 supporters of Neill-Fraser yesterday attended a fundraiser at the Royal Tasmanian Botanical Gardens to raise funds to finance further inquiries into the case, with the mysteries surrounding the case the major topic of discussion. “We have little doubt that there are still people out there with vital information to offer on the case and we hope to source up as much as we can and bring all the facts to light,” said event organiser Rebecca Harrison. “Many of the people here knew Sue well, others didn’t, but all are like-minded in the quest to put the pieces of this puzzle together. Victorian psychologist Eve Ash, who has been making a documentary about the high profile case since 2009, was among those who attended the fundraiser and said there were significant holes in the investigation that led to Neill-Fraser’s conviction. There was a small, sombre memorial service and vigil yesterday for the third anniversary of Bob Chappell’s disappearance. Neill-Fraser’s family has engaged the former head of Tasmania’s Integrity Commission, Barbara Etter, a former WA assistant police commissioner to re-examine the case. On April 12 2012 Sue’s new legal team lodged an application for special leave to appeal to the High Court. Again, a group of supporters went to the Federal Court building in Hobart on 7 September 2012, to watch by video the decision of the High Court in Canberra. Sue’s application for special leave to appeal was refused. Supporters of Susan Neill-Fraser hope a coronial inquest will reveal a miscarriage of justice surrounding her imprisonment over the death of her partner. S. McEwan is correct, there is need for an official inquiry to ascertain the true circumstances surrounding the death of Bob Chappell on Australia Day 2009 for which his partner, Sue Neill-Fraser languishes in Risdon Prison (Sunday Tasmanian, February 10). It was the tactics used by the prosecution rather than evidence presented by the defence which lost the case for Ms Neill-Fraser. It will require the inquisitorial nature of an inquiry to reveal what most likely happened to Mr Chappell that fateful night. In the February 17, 2013 edition of the Sunday Tasmanian, on page 63, a letter was published under the headline “Inquiry Supported” regarding the prosecution of Sue Neil-Fraser. That letter suggested that the conviction of Ms Neill-Fraser was secured by some unspecified unethical manipulation of the case on the part of the prosecutor. The prosecutor in that case was the Director of Public Prosecutions Mr T. J. Ellis, SC. The Sunday Tasmanian and its editor accept that the suggestion that was made is defamatory of Mr Ellis and that there was no basis to publish that imputation. There was no suggestion of any impropriety in the prosecution of the case against Ms Neill-Fraser. Additionally, there was no suggestion of any impropriety raised in the grounds of appeal, as argued before the Court of Criminal Appeal or the High Court lodged on Ms Neill-Fraser’s behalf. The Sunday Tasmanian and its editor sincerely apologise to Mr Ellis for the publication. On July 31, 2013, coinciding with the premiere screening on Foxtel’s Ci (crime & investigation) channel, Eve Ash premiered her documentary film, Shadow of Doubt to a full house at the State Cinema and took questions after. The Attorney-General was present but, when asked what she thought of the film, replied that, having read the decision of the Criminal Court of Appeal, she had not changed her mind about Sue’s guilt. Shadow of Doubt had a great impact on many people many of whom were willing to sign our petition and gave us their email address for our mailing list. Civil Liberties Australia did great work showing the documentary in Canberra and Sydney, wrote some straight-talking articles about Sue’s case and joined us in badgering politicians, especially the attorney-general. By 2014, we realised that Letters-to-the-Editor to newspapers were not enough to bring about change. So, on 18 January 2014, we placed an advertisement in the Mercury for a PEACEFUL, PROTEST GATHERING on Parliament House lawns to mark five years since Bob’s disappearance. We held the rally on Saturday 25th at 11.00 to catch the crowd going to and from the Salamanca Market, rather than Sunday 26th when we might clash with the aboriginal ‘Invasion Day’ protest. The speakers were Andrew Wilkie MP, who had attended a screening of Shadow of Doubt in Canberra, Eve Ash who had written and produced the documentary, Greg Barns, a local barrister and journalist, Barbara Etter, Sue’s lawyer and Sarah Bowles who read a letter from Sue. Eve Ash’s documentary, Shadow of Doubt, was screened again at the State Cinema that day at 1.00 pm and also on 29th at 6.15 pm. Supporters waited at the cinema door as people exited, prepared to discuss the film with interested patrons, of which there were a few . SUPPORTERS of Susan Neill-Fraser have vowed to fight on against her murder conviction despite a coroner finding there was no need for a full inquest into the death of her partner, Robert Chappell. Supporters of Neill-Fraser said the report did nothing to alter their campaign. The Sunday Tasmanian, the following day, 26th January, with headlines, Neill-Fraser pleads her innocence in letter to rally and ‘Five years of horror’ had a photo of a group of supporters who came dressed as convicts, one being Sue’s former husband Brett Meeker, whose placard read ‘Tasmanian Justice is Unjust’. We believe between 200 to 300 people attended the rally; it was a little hard to count as passersby from the Saturday market would stop for a while and move on. One thing is for certain in the matter of Sue Neill-Fraser’s conviction for the murder of her partner Bob Chappell, those calling for an inquiry or a retrial will not be silenced. For them to “put up or shut-up”, as Police Association secretary Pat Allan put it, is out of the question. The quest for justice for Ms Neill-Fraser is not going away. For her to be denied threatens us all. I call upon the Attorney-General to hasten in bringing an end to our uncertainty. Release her and initiate an inquiry into Chappell’s murder. With a State election coming in March, letters were flying to all politicians asking them that, if elected, would they support an independent inquiry and the setting up of a Criminal Cases Review Commission. Meanwhile, small vigils were being held in the CBD on Fridays at lunch time and in the Parliament House Gardens on Saturday mornings. On 18 March 2014, the core committee decided to meet on the second Tuesdays of the month; we talked of regular vigils; Jennie to investigate an alternative venue to the cinema; Amanda to enquire about t-shirts for vigils; to hold a candlelight vigil on 20 August to mark Sue’s arrest four years prior; and to explore fund-raising events. On 17 April, I noted in a letter to the supporters that “At our next meeting on Tuesday, 13th May at 10.00 a.m. at Leprena, we will need to elect a treasurer and open an account in Sue’s name. On 10 May 2014, we held our first fund-raising event – a visit to the historical property called Shene at Pontville. The owner of the property was offering a tour and morning tea for $35 per head, $10 of which would be for a fund for Sue. On 28 May, many supporters attended a talk at the University by Stuart Tipple, Lindy Chamberlain’s lawyer. On 13 June, we had our first Candlelight Vigil on Parliament House Lawns to show Hobart that – We care about Justice. And on 30 June at 6.00 pm we showed Shadow of Doubt as a fund-raiser, making it available for those who missed out in January and those who wanted to see it again. We raised $935.00. It was a difficult event to organise and we felt rewarded by the amount raised. We gathered more supporters when it was shown in Deloraine by their film society. With the success of the Candlelight Vigil, and at the request from a National media source, another vigil was held on 27 June. There were a couple of surprises this time: one supporter made a gift of hot chocolate drinks to warm us up, and a ‘catchy’ tune was played written and composed by a group of musicians in Melbourne calling themselves ‘Grand Jury’. This group, including a lawyer, were outraged at the unsafe verdict of Sue’s trial, believing it was a miscarriage of justice. Meanwhile, somewhat Ironically, on the previous day, a brave magistrate said in relation to a fatal road accident, “I am satisfied beyond reasonable doubt that Mr Ellis consciously drove his vehicle on the incorrect side of the road and continued to drive his vehicle on the wrong side until the point of impact with the vehicle driven by Ms Pearn”. He also said, “The defendant failed to exercise the degree of care that a reasonable and prudent driver should have exercised in the circumstances”. Come July, we were an incorporated body, Neill-Fraser Support Group Inc, and had a bank account with MYSTATE. Eve Ash was planning postcards for us to distribute at rallies, or use to letter-box in the suburbs and was suggesting that billboard/s advertise a REWARD for information leading to Sue’s release. As articles, some written by supporters, were published in the online press, Tasmanian Times, we were responding to comments on the threads that followed the articles. And on Monday 7 July, the Mercury published 5 letters from supporters giving us a whole page plus a photo of Sue. On 16 July 2014, supporters swallowed hard when they read in the Mercury, “An interstate judge may have to preside over a Supreme Court appeal by Director of Public Prosecutions Tim Ellis SC – who is seeking to overturn a guilty verdict in a negligent driving case. “His lawyers have asked for the sentencing to be delayed until after the appeal. Their application was opposed by Tasmania Police. “Justice David Porter this morning granted Ellis’ lawyers a temporary stay of further proceedings in the Magistrates Court. “But he disqualified himself from hearing the final application and said another judge would have to be found. “Justice Porter did not give a reason for disqualifying himself. ‘It may be, of course, that no judge of this court is able to deal with any substantive issue,” he said. Dr Robert “Bob” Moles, Eve Ash and Andrew Wilkie MP were speakers at the rally. During his 4-day visit, Bob Moles gave a presentation at the Wesley Hall, was interviewed by a Mercury journalist, briefed government politicians, talked with Michael Stokes from the Utas Law School, and had a Q&A session at the town hall, following the rally. Family and supporters of convicted murderer Susan Neil-Fraser say the decision by Tasmanian Attorney-General Vanessa Goodwin to introduce expanded right-to-appeal legislation based on the existence of new evidence offers genuine hope for the 59-year old inmate. The right to appeal legislation passed through Tasmania’s Parliament with unanimous support yesterday. His barrister, Paul Holdenson QC, said the magistrate had made his findings on a flawed understanding of the defence case. Crown Prosecutor, NSW Deputy Director of Public Prosecutions John Pickering SC, said the decision was a carefully considered and meticulous analysis of the facts beyond reasonable doubt. Small vigils continued throughout the year and 2015 began with another rally close to the date of Bob’s disappearance. Why: To remember Bob Chappell who disappeared on Australia Day 2009 and to rally for Sue’s case to be reviewed. Do you remember Bob Dylan’s ‘Hurricane’, written for Rubin ‘Hurricane’ Carter? This is your opportunity to hear it and songs written for Sue. Bring a picnic lunch, or buy from the Market, and listen to the music. Bob Dylan, Neil Young and Cold Chisel have been enlisted in the campaign to free convicted murderer Sue Neill-Fraser. A mystery band calling itself Grand Jury has borrowed tunes of the music greats to produce a CD in support of Neill-Fraser. The CD is being sold for $10 to raise money for the campaign. Several vigils will be held around Hobart at lunchtime. On 19 May 2015, Sue’s mother, Helen Neill-Fraser died. She was 86. Sue was allowed to attend the funeral on Friday 29 May. Many supporters joined family and friends. Ms Giddings said supporters were hopeful new right-to-appeal legislation would help set her free. “We have hopes but we are concerned that it is basically for new and compelling information,” she said. She said Neill-Fraser continued to hold out hope that a review would lead to her eventual release. A message from Neill-Fraser will also be read out to the weekend’s rally which will be addressed by shadow attorney-general Lara Giddings and barristers Greg Barns and David O’Brien. A young Hobart private investigator missing for nearly 35 years is dead, a coroner has found. Dennis James O’Day has not been seen since August 23 1980. He (Coroner Cooper) said he was satisfied that on the balance of probabilities Mr O’Day was dead having taken his own life while distressed at the end of his relationship. This, of course, is the same ‘young, disappearing Mr O’Day’ to whom DPP Ellis referred in Sue’s trial. Pity is, the inquiry came years after the jury sat through Sue’s trial instead of a few years after his disappearance in the 1980s. Convicted murderer Susan Neill-Fraser’s legal team has lodged appeal papers with the Supreme Court in Hobart, under new right-to-appeal legislation. Under the legislation, which came into effect late last year, if a convicted person satisfies the Court of Criminal Appeal there is “fresh and compelling evidence” and there has been a substantial miscarriage of justice, the court may enter an order of acquittal or a retrial. On 7 May 2016, the Fairfax Press in its Good weekend magazine published an excellent article, Waters of Doubt. They asked the question “is this the greatest miscarriage of justice since Lindy Chamberlain? The story “Waters of Doubt” (Good Weekend, May 7) dealt with the murder conviction of Sue Neill-Fraser in Hobart in 2010. Parts of the story incorrectly described the conduct of the trial and the role played by the prosecutor Tim Ellis SC, the former Director of Public Prosecutions. In particular, Mr Ellis did not put to the court that a laptop in Neill-Fraser’s home was used to search when a person was legally dead and did not withhold evidence about a guest user password. Mr Ellis did not insinuate to the jury that Neill-Fraser may have been connected to the disappearance of a young man 20 years earlier. Mr Ellis did not allege in court that CCTV footage of a car like Neill-Fraser’s was evidence of her driving away from the murder scene. Good Weekend withdraws these assertions and any suggestion that because of them Mr Ellis was responsible for a miscarriage of justice. Good Weekend apologies to Mr Ellis for any embarrassment caused. The Neill-Fraser Support Group has consistently argued that her guilty verdict was a serious miscarriage of justice “as the finding was based on purely circumstantial evidence”. Vigils will be held today outside Centrepoint in Murray Street, and outside the Commonwealth Bank (Elizabeth and Liverpool streets) from 12-2pm and on the corner of Murray and Macquarie streets at 5pm. A vigil will be held tomorrow on Parliament House lawns from 10am-12 noon. In addition to these planned vigils, a group of the fitter supporters could pop up anywhere, alone or in pairs, mostly near traffic lights and mostly early in the morning to catch people going to work. Others letter-boxed suburbs around Hobart with Quaker pamphlets and postcards. Their tireless enthusiasm that is not recorded in the press needs mentioning. Say what you will about supporters of convicted murderer Susan Neill-Fraser, there is no denying their persistence. A unanimous guilty verdict, failed appeal, High Court rejection, an unfavourable coroner’s finding and a shaky new bid for freedom have done nothing to blunt their conviction that Neill-Fraser didn’t kill her partner Bob Chappell. If anything, each setback serves to strengthen their belief that there’s something wrong with the justice system and Neill-Fraser’s 23-year jail sentence. Holding a battered “Sue Neill-Fraser is innocent” sign, Jennie Herrera was yesterday among a handful of supporters in Hobart’s CBD marking the seven years since her incarceration. Ms Herrera is president of Neill-Fraser Support Group that has up to 30 members. Ms Herrera said she would never give up on getting Neill-Fraser exonerated. For Ms Herrera, who knew Neill-Fraser and her mother before the murder, it was the prosecution’s time line. It never added up, she said. Mr Chappell hasn’t been seen since Australia Day 2009 when he disappeared from the couple’s yacht moored in Sandy Bay. “Strictly speaking, nobody knows that Bob Chappell is even dead,” Ms Herrera said. The group and their namesake are buoyed by the current case before the Supreme Court. It’s being made possible under new right-to- appeal laws that allow for an acquittal or retrial if “fresh and compelling evidence” can be produced. Note: While 30 members might represent our core group, there are over 100 on our email list, many in the north of the State, some Interstate and a few overseas. Editor’s note: We – along with members of the Sue Neill-Fraser Support Group – continue to follow the case of Sue Neill-Fraser as it makes its historic way through the latest appeal process. Also watching with interest (and concern) are members of the legal fraternity around Australia, the media and the general public. Our reporting will continue. Thank you Andrew, Jennie and Lynn: as one of those in the north of the state, I was not closely aware of the case … until on Tasmanian Times Andrew Urban and Ben Lohberger’s differing points-of-view were published together in an article entitled “Sue Neill-Fraser: Two views of her guilt” (25Aug2014). That published article resulted in an ongoing comment thread which is still active. I believe that this article and its comment thread was perhaps instrumental in the publication of the trial transcript (around 11Sept2014). This case has brought into public question the system of justice in Tasmania, has spawned a determined group of supporters of Sue Neill-Fraser and of justice itself, has seen new second-appeal legislation passed and now has seen much evidence presented in the 2017-2018 court hearings. Thank you for this record of the history of the Supporters of Sue group. An excellent summary Andrew, Jennie and Lynn – Thank you.